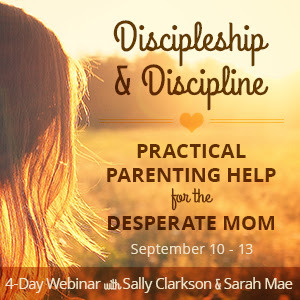 I am so pleased to have the opportunity to encourage all my readers with children at home to consider this 4 day webinar with two of my favorite authors: Sally Clarkson & Sarah Mae! The beauty of this seminar is that you can have it anywhere you'd like, as long as you have Internet. From the comforts of home to a quiet coffee shop alone... perhaps the Lord may work it out so that you can view this with other mom friends as well! God bless you as you work diligently in your most precious ministries the Lord has called you into: motherhood. Observing God as a parent gives us a pattern to follow as we seek the best for our own children. God extends His love, training, and instruction throughout the Bible for the benefit of His children that He loves. In this session we will cover Biblical principles and practical ideas of how to build a winning relationship with your own children so that their heart will be turned towards you as a parent. Understanding Jesus’ motivation with his own disciples lays a foundation for reaching our own children’s hearts. If there is one thing that I get the most emails and comments on it is my precious Caroline, the former “wild one”. I say former because over the last year she has matured into the most delightful little girl. But it took work and time and intention, and in this webinar I will share with you the journey, the ups and downs, and what things have made the biggest impact on my Caroline becoming a genuine delight. If you have a wild one, I’ll show you how to hang in there with grace, nurture change, and genuinely enjoy your child. I believe that respecting our children, relating with them, being honest, and treating them as we would like to be treated is foundational for building loving and trusting relationships. However, in order to be able to parent this way, we first need to deal with our junk. In this webinar, I will talk about what hinders our ability to parent in freedom and what steps we can take to become true and whole so we can parent with clarity. Viewing your child from a Biblical perspective will determine how you view the role of discipline in your children’s lives. In this talk, the goals of discipline will be laid out, and practical advice will be given for the different stages of a child’s life. Learning to see each child for the unique design God gave them will free you, as a parent to understand how to reach their heart and motivate them to learn to listen to your instruction and to obey your training. The second half of this Webinar will be dedicated to answering your parenting questions.